For the first time, a Tamil film was chosen as the Best Film in the Malaysia Film Festival (28th Edition) in 2016, amidst controversy. This was a landmark recognition for Tamil films made in Malaysia. Until then, several young filmmakers had had many doubts of their own about the future of locally produced Tamil films and their distribution in Malaysia. Jagat (2015) opened their minds to infinite possibilities. Filmmakers like Yasmin Ahmad and Amir Muhammad were the face of Malay cinema in Malaysia and their films received critical acclaim at many international film festivals. It’s important to note here that Yasmin Ahmad’s Sepet (2004) won international acclaim at film festivals around the globe. Her films faced severe criticism in Malaysia because they demolished purist religious ideals and erected new constructs in their place. It’s a good sign if cinema as well as cinema criticism flourish side by side and this is evident with regard to the Malay cinema of Malaysia. The Chinese cinema of Malaysia has undergone many changes in technology, and in choice of subjects for storylines. The Journey (2014) broke all box office records in Malaysia at the time of its release. The film depicted the culture and lives of Malaysian Chinese and their conflict with western ideals. It demonstrated that Chinese cultural beliefs can be deconstructed and questioned with success. This film’s subtlety was in sharp contrast to the image of an art film conjured by Yasmin Ahmad. 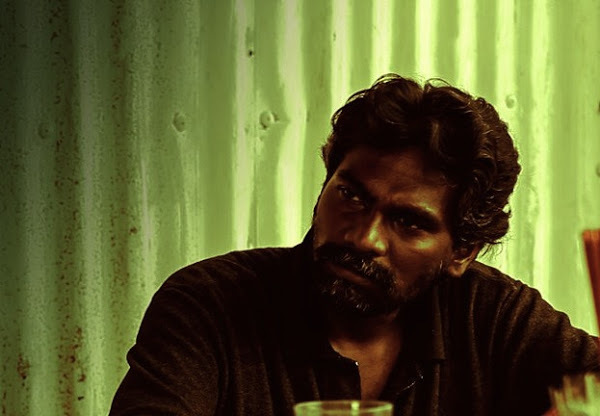 Perakas Rajaram directed Vennira Iravuggal (White Nights, 2014), the first full-length experimental Malaysian Tamil film. Following his footsteps, a young Shanjhey Kumar Perumal made his directorial debut with a firm grasp on Malaysian politics, culture and arts. 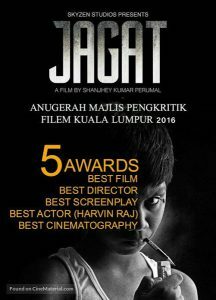 His film Jagat (2015) was initially disqualified from competing under the Malay category in the Malaysia Film Festival. But after widespread backlash, the Malay and non-Malay categories were merged into one and Jagat won the Best Film award among all Malaysian films competing that year. What was so special about Jagat that it earned the support of filmmakers across all languages and races? Jagat was initially made as a short film and later expanded into a feature film. A youngster enters the small-scale fishing business in Pangkor island in 1978. Within a year, he becomes the leader of a gang that smuggles weapons along the coastlines of Malaysia and Indonesia by hiding them in fishing boats. Jagat, the short film, is the story of one such criminal. The focus of Jagat, the feature film, shifts to the younger brother of this gang leader and the twists of fate in his life. Actor Senthil Kumaran Muniandy played the main gangster in the short film. In the feature film, he played a minor character who gave up the gangster life. 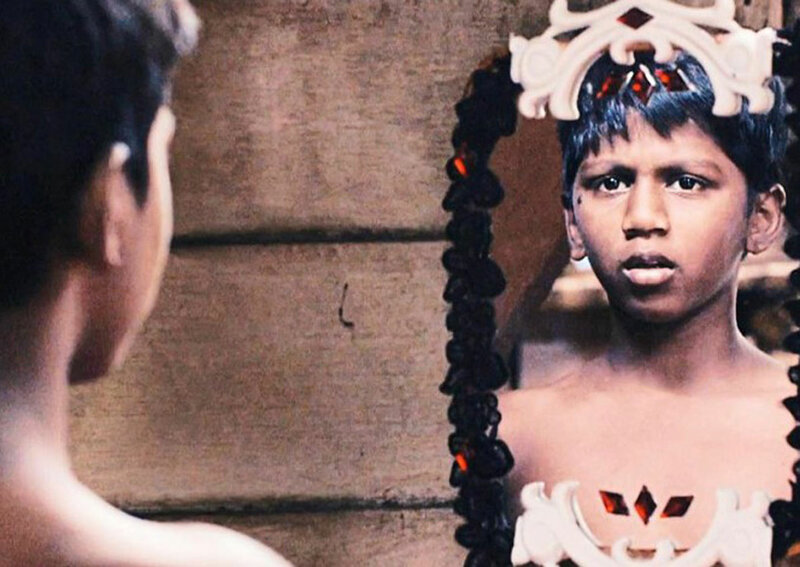 Both films probe and comment upon the darker side of the lives of Malaysian Indians. Jagat, the feature film, begins with the story of a youngster who quits a gang when he realises he’s being oppressed. The film also shows us another boy neglected by the educational system, who feels empty inside and finds refuge in a gang. The heart of Jagat, the feature film, resides in the twists in the lives of these characters. The Lord may forgive us our sins but the moral codes of men never will! A deserted restaurant languishing in semi-darkness. Two men shorn of all facades. They’re having a conversation over drinks. Scenes of the past spring from their conversation and pull us into the strong currents of their lives. Jagat, the short film, introduces us to the lives of its people through a conversation. Truth is something personal. When people can’t fathom the truth, they convert their failure into beliefs and personal philosophies, and lead a life of pandemonium. The old man, who’s the protagonist of Jagat, the short film, is engaged in a long conversation with the man seated in front. But this conversation is actually between his present self at the tipping point of delirium and his ignorant past self that wandered in search of an undefinable something. Rather than mulling over what constitutes a crime, the legal system is obsessed with who committed the crime and the punishments to be meted out. Shanjhey’s Jagat, the short film, is an open invitation to a dialogue about this system. “The truth that you believe in today could become a lie tomorrow. The lies of today might become the truths of tomorrow. Your entire life might become a farce in an instant.” These lines uttered by the old man are horrifying, yet ring with truth. He refuses to search for the eternal truth and puts forth a new ideology of making your life meaningful by living as you please. “People label others as bad men, so that they may safely call themselves good men. Black people like us are needed to make them appear white,” the old man says. With these lines, he shatters the agenda of identity politics hidden beneath the guise of morality, and puts forth a new ethical code in its place. The old man was the leader of a gang during the 1980s and was involved in crime. Since he was the head of a group pitted against the law, he believes situations are always against him. This brews a deep sense of distrust in his heart, which later makes him a murderer. He imagines a world for himself that’s consistent with his emotions and thoughts. The old man speaks from within this world he created for himself. That makes Jagat, the short film, a lone man’s dialogue. When you inspect some of the greatest philosophies in the world, beneath the layers you’d always find a person’s loneliness safely hidden. Your life reflects your perception of the universe. There’s a line in Jagat, the short film: the Sun provides but a momentary light in the vast darkness of the universe. Numerous transient relationships sprout around the periphery of one’s eternal loneliness. The love and compassion in each relationship help to hide one’s loneliness for a short while. But there comes a time when the eternal darkness of loneliness engulfs one’s life again. 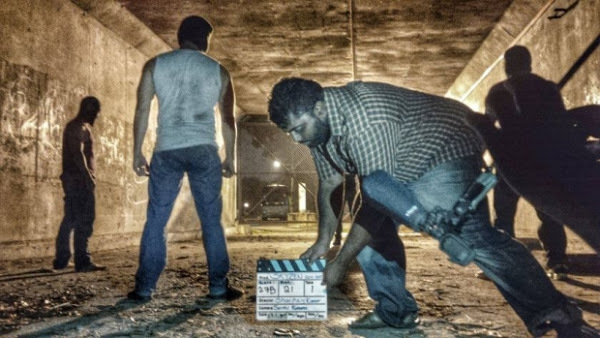 I grew up as a kid in Malaysia during the 1990s and therefore I was able to forge a strong connection with many scenes in Jagat, the feature film. It brought back many memories of my life. The film has many sublime moments where the character Shankar and I become one. Director Shanjhey has perfectly visualized the kampong (village) in which I grew up during 1995-96. The film’s backdrop and the characters fit the period perfectly and appear real. WWF (World Wrestling Federation) was popular at the time, and my friends and I would often attempt to wrestle each other in the school grounds. There was a student who organized these fights. He was huge, and we were all afraid of fighting him. So he was desperate to prove himself. He introduced to us the idea of a wrestling contest, which we would have to pay to join, and appointed himself in the lead role as the referee. Each one of us paid 20 cents for a fight. The winner would get 30 cents and the referee would get 10 cents. I was teased during many such fights. When a strong person defeats you physically and mocks you saying you’re good for nothing, anger and hatred well up within you. It creates a frustration in your heart and makes you wonder if life is worth living. The situation of Shankar in Jagat, the feature film, is the same. I lived in a kampong house that was similar to the one Shankar lived in. I’ve received the love and affection of my uncle’s friend just like Shankar. As shown in the film, my uncle’s friend was also arrested by the police a few times for gang fights. The life of the 1990s that Jagat has so vividly captured helped me relive my past. There’s a strong similarity between Jagat, the feature film, and a short novel I wrote back in 2014 entitled The 236th table conversation in an Ah Pek shop1. Both creations examine the life of crime of Malaysian Indians. Director Shanjhey was present at the launch of my short novel. It is interesting that both of us arrived at the same destination through our creations, he did it through his visual art while I did it through my written word. Our creations touched upon the vicissitudes of the lives of Malaysian Indians that hadn’t been explored in depth before in Tamil film or literature. Our creations laid bare the discrimination Indians face in Malaysia in all fields – be it political, artistic or educational – and its psychological impact. I once had the chance to interview director Shanjhey Kumar for Parai magazine. His goal was to make films that were firmly rooted in Malaysia without trying to mimic styles of other countries. I had expressed similar views in my reviews of Malaysian Tamil literature, stating that writers in Malaysia must come up with styles of writing unique to their context, rather than trying to mimic writers from Tamil Nadu. Shanjhey Kumar’s views on rooted cinema resonated with me. Satyajit Ray mentioned in an interview that cinema is essentially the movement of visuals. Jagat, the feature film, engages the viewer in a dialogue through its visuals. A news broadcast is heard on the radio in a particular scene. The news suggests that there’s no racial inequality in economic development under the rule of former Malaysian Prime Minister Tun Mahathir. The news quotes former President of Malaysian Indian Congress S Samy Vellu saying that Malaysia’s economic policies are helping all Indians rise out of poverty. At the moment when this news is heard, Shankar’s father is tying a plastic rope around his waist to hold his trousers in place. This is the power of cinema. A single poignant visual like this can be used to make a sharp criticism of the government’s ineptitude. This scene says everything it has to about the plight of Indians in Malaysia, it requires no further elucidation. The experience of watching Jagat is such that every single scene carries a weight that requires you to pause and reflect. Probably every household had a rule during the 1990s that kids must not watch television. My house had that rule too. While the rest of my family happily watched television in the hall, I’d be shut off in my room to do my homework. Since we lived in a wooden house the sounds from the television seeped into my room and I could hear them clearly. A scene in Jagat shows Shankar happily watching television through a crevice in the door frame. This scene took me back to my childhood. When Shankar’s father reaches home, he concludes that Shankar watched television by touching the glass screen and feeling the warmth. Such moments are like slices of real life. The scene in which devotees carrying milk pots and kavadi pass by Shankar’s house is staged deftly.. The camera determines how the viewers perceive the geography of the place where the characters live. Cinematographer Senthil Kumaran Muniandy has used light to capture the vibe of 1990s with accuracy. The interior lighting of Shankar’s house reminded me of the house in which I spent my childhood. A still from Jagat, the feature film, with Senthil Kumaran Muniandy, the cinematographer playing a minor role as a former gangster. He played the protagonist in Jagat, the short film. Shankar in Jagat, the feature film, is not your average student. He thinks outside of the school curriculum. When he tries to learn multiplication tables by going further than the 12 times tables he’s expected to know, average minds all around him suppress him by saying he doesn’t need to do things beyond the demands of his age and curriculum. His talents are refused any sort of recognition, he’s punished and flung aside by the educational system. The educational system prevents Shankar from discovering himself and forces him to embrace defeat. His world begins to shrink when the system finds his out-of-the-box thinking strange, and fails to recognize its worth. He is pressured by his father on one end, and the educational system on the other. At an unexpected moment, Shankar, a colourful balloon until then, explodes into pieces. The pieces fall into the criminal world of gangsters who’ve been cast aside by the nation. Shanjhey’s film is a bold criticism of the educational system as well. From the roots of criminals in Malaysia, he extracts a solitary wail that harks to the defeat of values. This solitary wail resounds as a cracking gunshot in Malaysian Tamil cinema. Ah Pek is a Chinese phrase that refers to an elderly person or uncle. Ah Pek shops refer to eateries run by Chinese people in Malaysia. Taken from A Dictionary of Singlish. Accessed on Jan 7, 2018. The original article appeared previously on Vallinam and the author’s personal website. We thank them for permission to reprint this article in its revised form. K Balamurugan is a creator actively involved in the Malaysian literary and magazine scene for the past thirteen years. He ran the Anangam magazine for three years, through which he introduced many new writers. 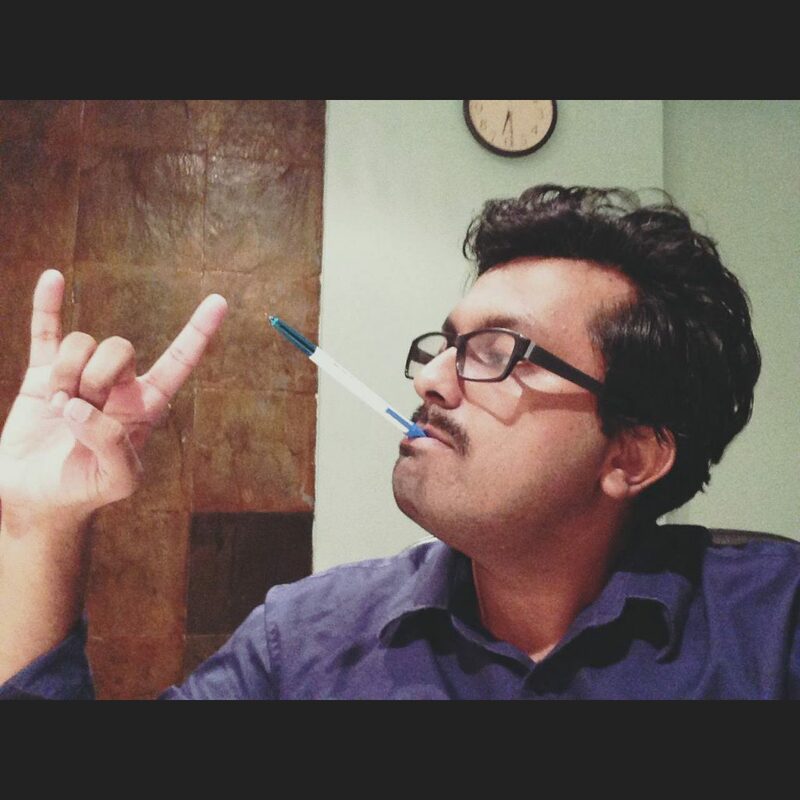 He currently manages Kazham, an online Tamil literary magazine. He has written eleven literary works so far, including short story anthologies, novels, poetry collections and cinema essay collections. 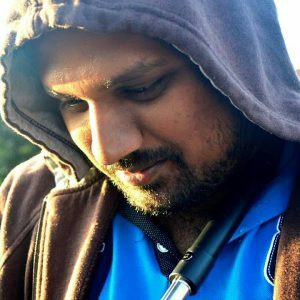 He works as a Tamil teacher in Malaysia. He has won many literary awards including Karikala Chozhan award, M.A. Ilanchezhian award, C. Kamalanathan award, Best Writer of Kedah award and the Best Young Achiever award. He writes regularly on his personal website, he is a film and literary critic as well.